As of 2019 in the U.S., dental implants cost ranges from $1,700 to $2,000, with the national average at about $1,800. For instance, average dental implants cost in Fort Lauderdale, FL is $1,700. Dental implant treatment can vary depending on your needs. Of course, a dental implant dentist will be able to fully determine the cost, which is based on the specifics of your individual dental needs. These factors can include the complexity of your case and how long a dental implant treatment will take. Dental Implant Payments Options and Financing. Should the cost of dental implants prove prohibitive for an individual, there are options to consider that can put dental implants within reach. We have found that LendingClub online application is fast and easy. It takes just minutes, with no impact on your credit score. Financial times have changed, and credit scores are no longer a main factor for patient dental implant procedure financing. You can instantly review the loan offers that you qualify for, and you'll never need to visit a branch to complete your application. Our dental office is affiliated with LendingClub for dental implant treatment. LendingClub can finance over $20,000 plus for upper and lower jaw full mouth teeth replacement. All LendingClub financing payment plans feature an affordable fixed rate, which means your monthly payment does not increase. In addition, you can prepay your loan at any time and there's never a prepayment penalty or fee. Does my dental insurance cover dental implants? Dental insurance plans may cover on average $400 - 800 towards dental implant cost just as they would with other teeth replacement treatments like dental bridgework. Either your dentist insurance provider or your dental insurance carrier can help you to determine the exact dental coverage for your dental implant treatment based on you dental insurance coverage policy. If your dental insurance does not cover all of your dental implant treatment costs or if the cost of a dental implant is a concern for you, talk to your dental implant dentist provider about payment options - many dental implant dentists offer flexible and affordable monthly payment plans and financing, many with no down payment and no interest. About one-half of dental implant patient use financing options to spread their dental implant treatment costs over time. The cost the insurance companies would cover on dental implants depends on many variables including the location of the tooth and the number of teeth. Because most dental insurance plans do not cover this cosmetic procedure, we can only give an estimated average insurance coverage for dental implant which is about 600 per implant. 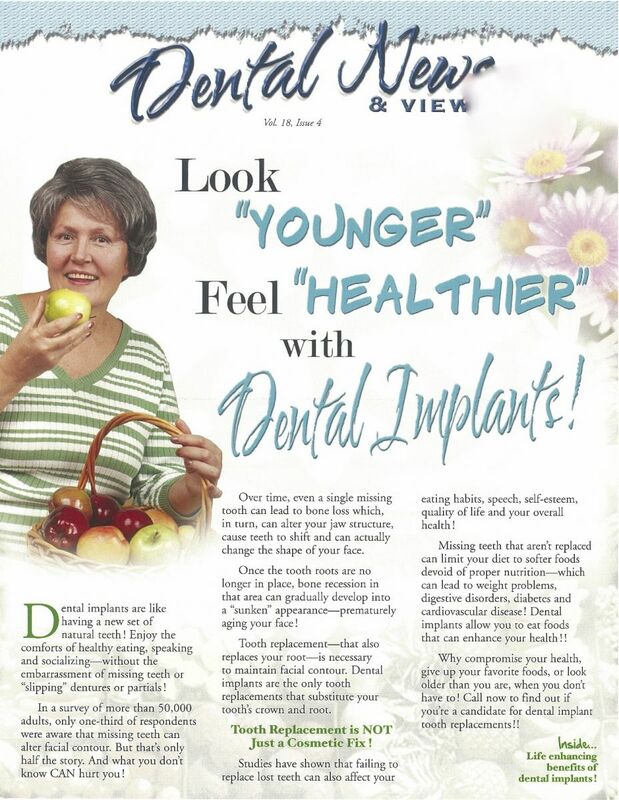 You can look younger and feel healthier with dental implants. Dental implants are like having a new set of natural teeth. You can enjoy the comforts of healthy eating, speaking and socializing without the embarrassment of missing teeth or “slipping” denture and partials. According to American Dental Association, a dental implant offers comfort, stability and is a dental restoration that is the closest thing to a natural tooth. In a survey of more than 50,000 adults, only one-third of respondents were aware that missing teeth can alter facial contour. But that is only half the story. And what you do not know can hurt you. Chewing, talking, laughing and even kissing are a few instances when the role of healthy teeth is often taken for granted, until one or more teeth are damaged or lost. Over time, even a single missing tooth can lead to bone loss which, in turn, can alter your jaw structure, cause teeth to shift and can actually change the shape of your face. Once the tooth roots are no longer in place, bone recession in that area can gradually develop into a “sunken” appearance prematurely aging your face. Tooth replacement that also replaces your tooth root is necessary to maintain proper facial contour. Dental implants are the only tooth replacements that substitute your tooth’s crown and root. According to the American Academy of Implant Dentistry, dental implants should always be considered as an option to replace a failing or missing tooth. Tooth replacement is not just a cosmetic fix. Studies have shown that failing to replace lost teeth can also affect your eating habits, speech, self-esteem, quality of life and your overall health. Missing teeth that are not replaced can limit your diet to softer foods lacking of proper nutrition which can lead to weight problems, digestive disorders, diabetes and cardiovascular disease. Dental implants allow you to eat foods that can enhance your health. Why compromise your health, give up your favorite foods, or look older than you are, when you may not have to. Dental implants are the next best thing to your natural teeth. Until you have experience tooth loss or having to adjust to partials or dentures you probably take for granted the simple pleasures of eating and tasting. Did you know that you can not fully taste food without “chewing awareness”? No matter how juicy that steak is or how tasty that spaghetti sauce might be, the eating experience goes beyond the mechanics of placing food in your mouth and chewing it. Your gums, teeth, and palate (roof of your mouth) each play a part in how your brain processes chewing forces and food tastes. When your gum surfaces, teeth and palate are covered by dentures or partial, chewing reception is altered dulling your sense of taste. The good news is dental implants help maintain normal “chewing awareness”. So if enjoying mouthwatering meals is an important part of your life, here’s just one more reason to consider the advantage of dental implants. Dental implants are second to none. No other tooth replacement compares to the look, feel and function of dental implants. The good news is most people are candidates for this exciting, time-tested and proven treatment option. In addition, in dental implants treatment no other teeth are involved but the missing teeth. Before stating with a dental implant procedure, there are a few factors to know and consider regarding the cost of dental implants and payment options. It is always a helpful to sit down with your dentist for a consultation to discuss all of your options. Dental implants may be covered by insurance, and the average price for a dental implant ranges between $1700 to $2000 for a single tooth. With proper oral hygiene, implants offer longevity; once they are placed, dental implants can last for many years. It may be possible to reduce the overall cost of the dental implant procedure, as the timing of can affect out of pocket cost. The implant procedure is typically a two-part process that consists of placing the implant; four month later the implant is restore with a crown (cap) or bridge. By scheduling the first procedure at the end of the calendar year, and then having the implant restored the following year, this allows you to use two years’ worth of pretax flexible spending mony through your employer. And if dental insurance covers a portion of the cost, you won’t go over the yearly limit. Remember, insurance available coverage does not roll over to the next year. With dental insurance is either use it or loose it. Patients that opt to pay for treatment with a financing plan should pay attention to the interest rate and penalties associated with the payment plan. Patients should try to find a plan that offers low interest rates, and pay each monthly installment on time to avoid additional fees. Several payment options are available to make having your best implant treatment possible. To learn more about how to make the best financial decision regarding your dental implants, book an appointment with the knowledgeable staff of Dr. Arocha’s practice today. Together, we can sit down to thoroughly go over your various payment options so that you can decide what option is ultimately best for you. Dental Implants Frequently Asked Questions. Dental implants are substitutes for the roots and crowns of missing teeth. They act as an anchor for one or a series of replacement teeth or can be used to anchor bridges and dentures. According to American Dental Association, candidates for dental implants need to have healthy gums and adequate bone to support the dental implant. A thorough evaluation by your implant dentist will help determine whether you are a good candidate for dental implants. Dental implant patients are of all ages and dental implants may be the right choice for anyone missing one or more teeth due to dental injury, gums disease or dental cavity. Dental implant is especially practical for patients who can no longer wear removable dentures. A complete oral exam, dental x-rays, dental and medical health history are necessary to determine if you are a candidate for dental implants. Do I have enough gums and bone to hold a dental implant? It is important for a dental implant patient to have enough bone to support the dental implant. If you do not have enough bone, there are many safe and effective ways to correct bone deficiency. Why replace my missing tooth in the back if I can't see it? For one thing, if you lose an upper tooth, you essentially lose the chewing function of that tooth and the one just below it. In addition, when you don’t replace a missing tooth, excessive force is then placed on adjacent teeth and may lead to tooth fractures and tipping. By ignoring damaged or missing teeth, you leave yourself prone to further tooth loss, teeth shifting, crowded teeth, speech problems, diet restrictions and other dental complications. Dental implants have been used for over 50 years. Unlike dental bridgework, dental implants don’t require the reduction of healthy adjacent teeth. Dental implants are considered more predictable than dental bridgework and root canals treatments.